I just spent 6 weeks in Istanbul, and was there for almost a month back in August. Although I’m certainly no expert on the city–only a true Istanbulite could say that, I think–I definitely learned at least seven things about life and travel there. Some of these are things I wish I had known before I went; others are tips from fellow travelers and ex-pats. They’re pretty basic, but I hope they’re helpful! 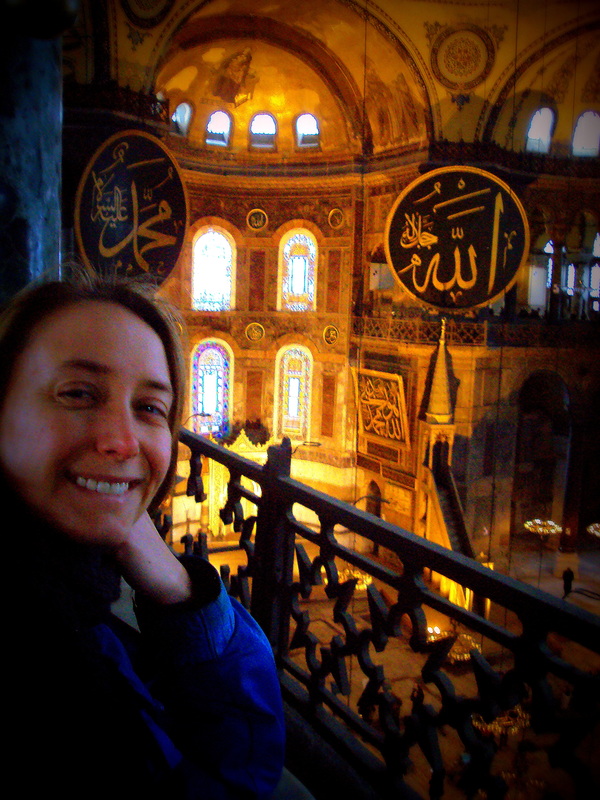 A (relatively unflattering) self-portrait at the incredible Hagia Sophia in Istanbul. 1. Carry a photocopy of your passport with you, especially at night. I don’t mean in your luggage, I mean on your person/in your purse/wallet. Police do make stops and checks, especially if you are in a car at night, and you can get in trouble if you don’t have this. Be sure you know where your physical passport is at all times in the unlikely event that they ask to see the original. 2. Don’t eat at restaurants where prices aren’t listed or at least establish prices before dining if they’re not. This is particularly true of the Sultanahmet area where most of the tourists go. If you aren’t careful, you’ll end up with an inexplicably high bill. Many if not most restaurants don’t itemize their receipts either, so it’s also important to be aware of listed menu prices. It happened to me enough times that things were ‘accidentally’ added to our bill that I stopped believing waiters were just having an off day. Always check your bill and if there’s a problem, speak up. 3. Be culturally sensitive. Istanbul in particular is a hugely diverse city with people from everywhere with all kinds of beliefs. With that in mind, there are certain parts of the city that are more traditional, and certainly parts of the country where it is respectful to cover up a little more than you might at home. 4. Mark your akbil/Istanbulkart with permanent marker or something so you know you’re getting the right one back when you find yourself on a crowded night bus. Often the post-midnight buses are sardine-like, and people just pass their cards up to be swiped for their fare. Those suckers all look the same unless you make it otherwise. I learned that the hard way and lost 15 lira on the card that I had just recharged. Here are a few specifically lady-related tips I got from an American woman who had been living in Turkey for fifteen years and had traveled the country back in the early ’80’s on her own and with girlfriends. According to her, traveling in Turkey these days is a “piece of cake” compared to when she had started. 5. Eat on the second floor of restaurants if that’s an option; I am told the first floors are more for single men and the upper ones are where families and couples eat. By sitting on the first floor, you are potentially inviting attention you may not want. 6. If you’re going to be in Turkey longer-term, make friends with locals, particularly a family or older couple. Trust me, it’s always good to have Turkish pals, especially when you have to do something like go to the emergency room. Which I did. 7. If you are the victim of harassment or unwanted behavior, make a scene. This is where speaking the language can be helpful (this ex-pat told me at that point she knew enough Turkish to tell the offenders off). Although it is a horrific event and my heart goes out to her family, what is also disheartening to me is the fact that many people might be discouraged from traveling to Turkey because of this tragedy. I can only speak for my experience, but I had an amazing time in Turkey. Istanbul is one of those cities that has a certain mysticism surrounding it. The country’s history and culture are rich, the food is frickin’ fantastic, and I met some of the warmest, most generous and hospitable people ever there. Disclaimer: I wasn’t traveling alone. But I knew plenty of young women like myself who were there traveling or teaching English or otherwise exploring Turkey solo. Have you ever been to Turkey? Share your tips below in the comments! Yes, I loved Turkey! I am glad that I learned about the first floor/second floor custom. It is not something that many tourists know, I think. 🙂 Thanks for reading the blog, I hope you liked it! Great tips thanks. I’ve only ever been to the really touristy beachy type resorts on Turkey, where I feel completely safe and everything becomes familiar on day 1. I’m planning to go to Istanbul next year so your post was an intersting read for me, I’m sure it will be a different, yet extremely enjoyable experience. Follow the Bumblings via email! Enter your email address to follow the Bumblings and receive notifications of new posts by email.